After Diego Maradona had punched in his ‘Hand of God’ goal to give Argentina the lead, one of the most vocal complainants was Terry Fenwick. His efforts to convince the referee of what he had seen fell on deaf ears and unfortunately for him there wouldn’t be much of an international future either. He had to wait until February 1988 to win another England cap, when he played in a 0-0 draw in Israel. Sadly for him that would be the end of his England career after 20 caps, with any hopes of further caps effectively ended the following year when he spoke out about the set-up under Bobby Robson – something the England manager took him to task over in the 1990 edition of his autobiography. A latecomer to the international scene, Peter Reid celebrated his 30th birthday during the 1986 World Cup just over a year after making his England debut. The absence of more established midfielders gave Reid his chance in three games at Mexico ’86 and he performed well, although the lasting memory for some would be of him struggling to get near Diego Maradona ahead of the second goal! Injuries restricted his involvement in the 1986-87 title success for Everton and he had to wait until May 1987 against Brazil for his next England cap. He won three more after that, the last coming against Switzerland in May 1988 as he just missed out on a place in the Euro ’88 squad. The stylish midfielder divided opinion between those who considered him England’s main asset and others who found him a luxury who they felt wouldn’t do the dirty work. Bobby Robson seemed to lie somewhere in between, starting him in all five matches during Mexico ’86 but in the period that followed seeming more reluctant to choose him. He won a further 15 caps, but six would come as a substitute. England’s defeat by the USSR at Euro ’88 saw Hoddle at fault for the opening goal and he would never be picked again – his total of 53 caps considered by the Hoddle fan club to be a poor return for a player of his abilities. He would later become England’s manager, again experiencing the pain of losing to Argentina at a World Cup in 1998. England’s left back slot had been dominated for several years by Kenny Sansom and he would remain first choice for the next two years and win a further 16 caps, despite growing competition from Stuart Pearce. During Euro ’88 Sansom took the blame for the goal England conceded as they lost to the Republic of Ireland, although he featured in the subsequent two matches at the tournament. But like Hoddle he was never capped again after the USSR match. Sansom paid for losing his place in the Arsenal side as well as the emergence of both Pearce and Tony Dorigo, as he finished his England career with 86 caps. England central defender Terry Butcher would be no friend of Maradona after the Hand of God, saying more than 20 years later he would never forgive him for it. Mexico ’86 was the middle of three World Cups he featured prominently in and he remained a regular for the next four years, captaining the side on several occasions. He was greatly missed at Euro ’88, when he was ruled out through injury. The lasting image of him in an England shirt was when he was absolutely covered in blood during the 0-0 draw away to Sweden in 1989. Italia ’90 marked a natural parting of the ways, starting five games as Bobby Robson stood by him despite his long-serving player having appeared to heatbutt an opponent during a friendly in Tunisia. His 77th and final cap was won in the semi-final against West Germany, when he was substituted. The absence of Bryan Robson and Ray Wilkins meant goalkeeper Peter Shilton captained England in their final three matches of the 1986 World Cup, a tournament he would mainly remember for being beaten by the Hand of God. Shilton remained first choice for the next four years, even though Bobby Robson did briefly consider replacing the veteran after Euro ’88. That tournament saw Shilton earn his 100th cap against the Netherlands at Euro ’88 and against the same opponents at Italia ’90 the 40-year-old surpassed Pat Jennings’ UK record of 119 caps. He finished with 125 caps, announcing his international retirement after the third place play-off against Italy – departing following the same game as manager Bobby Robson. Shilton remains England’s most capped player, although Wayne Rooney is closing in on the honour. 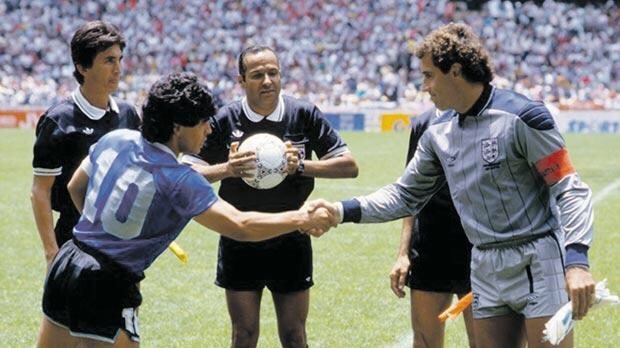 Midfielder Steve Hodge would be the man who ended up with Maradona’s shirt after the World Cup quarter-final. His appearance in the match marked a meteoric rise to prominence, having made his England debut just three months before. He played in seven matches in 1986-87 but then won just one more cap until November 1989. Hodge worked his way back into the reckoning and was a part of the Italia ’90 squad, although he would be the only outfield England player not to play in any matches. The appointment of Graham Taylor as manager in 1990 would not work out well for Hodge as he played just two matches under him, the last one being away to Turkey in May 1991 as his England career ended with 24 caps – 16 of them earned after the 1986 World Cup. One of two wingers brought on by England as they sought to get back into the game against Argentina, Chris Waddle remained prominently involved during the rest of Bobby Robson’s years in charge. This would include being part of the squad during Euro ’88 and Italia ’90, the latter tournament proving bitter-sweet as he played in a World Cup semi-final but missed in the shoot-out defeat by West Germany. Waddle was one of several established England players to fall out of favour under Graham Taylor. He played in Taylor’s first two matches, but had to wait a year to earn another cap against Turkey in October 1991. Waddle was never capped again as he finished with 62 England appearances to his name. Confusingly one of two players of the same name in England’s 1986 World Cup squad, ‘Everton’s Gary Stevens’ started all five games in the tournament. He had to wait until the following May to win his next cap but after that he was a regular for three years, starting all three games at Euro ’88. It was at Italia ’90 his England career began to fall apart, as he was dropped after the opening game against the Republic of Ireland and didn’t return until the third place match against Italy. The arrival of Graham Taylor as manager didn’t help matters, Stevens earning just five more caps as he fell further down the poking order. He looked set to play during Euro ’92 after injuries to his rivals for the right back slot, but was himself then injured in a warm-up match in Finland. It was his 46th and final cap. Midfielder Trevor Steven was one of four Everton players to start the match against Argentina, as he earned his 14th cap. Over the next six years a further 22 would follow, playing two matches at Euro ’88 and three at Italia ’90 – including a semi-final appearance as a substitute in the latter. Steven would have spells out of the side but he was part of the Euro ’92 squad, playing in matches against Denmark and France. This marked the end of his England career after four major tournaments and 36 caps. 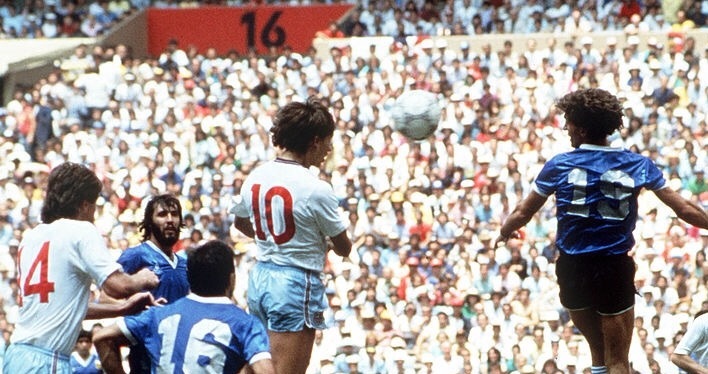 A goal against Argentina led to Gary Lineker finishing top scorer at the 1986 World Cup, while so nearly getting another that could have forced extra-time. He remained a regular for England after moving to Barcelona that summer, scoring four times against Spain in February 1987. Lineker surprisingly failed to score during Euro ’88, but it soon came to light he was suffering from hepatitis. He would endure a barren 1988-89 season, having to wait until April for his next England cap. After this he got back into his stride and scored four times during Italia ’90, including an equaliser in the semi-final against West Germany. Lineker became England’s regular captain under Graham Taylor, netting a crucial equaliser against Poland to take England to Euro ’92. He went into the tournament looking set to become England’s record goalscorer, but he fell one goal short and was substituted in the final group stage defeat by Sweden. It was an anti-climatic end to an England career comprising of 80 caps and 48 goals. During the 1986 World Cup John Barnes only played for 16 minutes, but in that limited time he made a significant impact as he set-up Gary Lineker to score and then so nearly equalise. It would be up there with his goal against Brazil in 1984 as his most celebrated moment in an England shirt, with critics believing he did not deliver like he did for his club. That view was strengthened at Euro ’88, when he lacked the sparkle shown for Liverpool during 1987-88. But Bobby Robson continued to regularly select him and Barnes started England’s first five matches at Italia ’90. The appointment of Graham Taylor as manager in 1990 meant they were reunited after their Watford days, with Barnes remaining a regular although he only played twice between May 1991 and February 1993 amid injury problems – missing Euro ’92 as a result. Barnes played six times under Taylor’s successor Terry Venables but he would be out of the picture come Euro ’96, with Barnes earning his 79th and last cap against Colombia in September 1995. Capped for the first time in January 1986, Peter Beardsley worked his way into the England starting line-up for Mexico ’86 and was the only player other than Gary Lineker to score for them at the finals. He stayed firmly in Bobby Robson’s plans, despite the manager occasionally preferring a bigger man to partner Lineker. He played in two games at Euro ’88 and five at Italia ’90, but he would be another player to then fall out of favour under Graham Taylor. He played four times for the new manager but was never picked again by him after May 1991. That appeared to be the end of the international road for Beardsley, but the appointment of Terry Venables in January 1994 would herald an Indian summer to his England career. He earned 10 more caps with the last coming against China in May 1996. Beardsley narrowly missed out on a place in the Euro ’96 squad a decade after Mexico, having won 50 of his 59 caps since then. 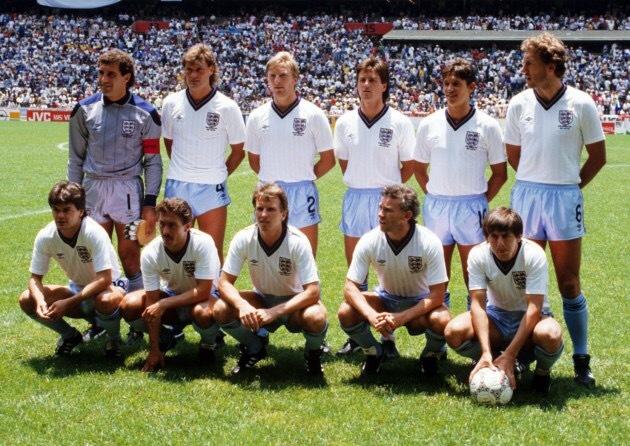 Of the nine members of England’s squad who didn’t play against Argentina, Gary Bailey and Gary Stevens (the Spurs version) were never capped again while Kerry Dixon, Alvin Martin and Ray Wilkins would make their last appearances before 1986 was out. Viv Anderson, who had missed out on playing any matches in the 1986 World Cup, regained his place and won nine more caps with the last coming in May 1988. Bryan Robson, whose tournament was blighted by injury, remained captain but a similar fate would strike him at the 1990 World Cup. He won just three caps after that, the last in November 1991. Mark Hateley won 10 caps over the next two years, later making a one-off return in March 1992 against Czechoslovakia. Chris Woods remained a patient deputy to Peter Shilton for the next four years, finally becoming regular goalkeeper in 1990. A loss of form led to him never being picked again after a 2-0 defeat to USA in June 1993, his 43rd cap. England, Football, Hand of God, mexico 86, Squad, What Happened Next?